How do I perform a ride? When driving on HopSkipDrive rides, you’ll be working closely with the HopSkipDrive app and possibly our Live Operations Team. This team monitors all HopSkipDrive rides and is there to help when you get stuck. Please add their number to your phone’s contacts right now: 844-467-7547 (Ext 2, Option 1). In advance of the ride, you should know the number of seats, booster seats, and the route you’ll need to take for the ride. Be sure you have the HopSkipDrive decals, t-shirts, and boosters in your car and ready to go. When it’s time to begin a ride for HopSkipDrive, open your HopSkipDrive app. Click on the upcoming ride. You’ll have to click the blue “Check In” on the ride 90-60 minutes before the ride’s scheduled start time. This is how the Live Operations Team knows you haven’t forgotten the ride. If you neglect to check in at least 60 minutes before the ride’s pickup time, you may be replaced. After checking in, review the ride’s details. Be sure you know when you need to leave your house in order to make the schedule pickup time. Be conservative and plan for traffic. To see more information about the riders, click on the drop down arrow to the right of the rider information. A box with more information will drop down. Be sure you have the booster seats you’ll need in your car. To see more information about the ride’s pickups and drop offs, click on the drop down arrow to the right of the number of stops. When you’re ready to start driving, click on the orange “I’m Leaving Now” button. 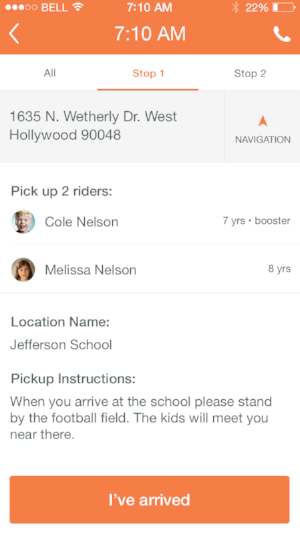 On Step 2 of your ride, you’ll see the rider names and ages and the address details, location name, and the pickup notes. To use your phone’s GPS to navigate to the pickup location, click on the “Navigation” button in the top right corner of the screen. When you click the navigation button you’ll be rerouted to the navigation app on your smartphone. The HopSkipDrive app does not provide navigation, but will autofill the addresses into your navigation app. HopSkipDrive requests that you only use Google Maps to navigate. It’s always wise to double check that the addresses that autofilled were moved to the navigation app correctly. To return to the HopSkipDrive app from your phone’s navigation, close your navigation app and click on the HopSkipDrive app again. When you have arrived at your pickup location, be sure to follow the pickup notes provided by the ride organizer. Many parents will ask you to meet their child at a specific intersection or to park and go inside to sign their child out. It’s always a good idea to bring your driver’s license with you when signing out your riders. Many riders depend on you to wear your HopSkipDrive t-shirt so they can find you, so please put it on upon arrival. Click the orange “I’ve Arrived” button once you’ve digested the pickup notes and are ready to find the rider. Clicking this button also helps the ride organizer and our Live Operations Team know that you are where you need to be and ready to pickup. If you’re confused and need help locating the pickup location or the rider, you can click the phone icon in the upper right corner of the screen. 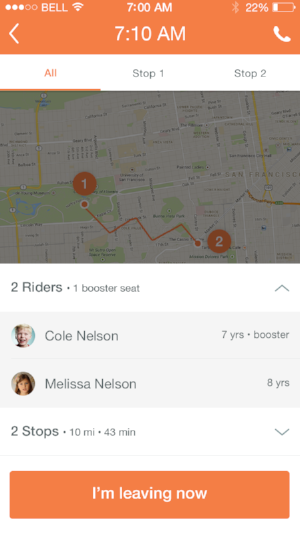 You’ll be able to call the rider using the HopSkipDrive app (if they have a cell phone) and the ride’s organizer. If you can’t reach either and need help, call HopSkipDrive’s Live Operations Team at 844-467-7547 Ext 2, Option 1. After you’ve clicked “I’ve Arrived” in the app you’ll be able to confirm your rider’s security information. When you locate your rider, tell them the secret code word and check the box in the app. Ask the rider for their birthday and check the box in the app, once confirmed. The birthday security step is relatively new so not all riders will have it. When both security steps have been taken, click the orange “Confirmed Rider”. Do this for each rider on the ride. If you have gone through the security steps for each rider, click the orange “I have X Riders in the Car” button. If you made a mistake, you can always click “Undo” beneath “Confirmed”. Be sure to only click the “I have X Riders in the Car” button when all the riders are safely buckled into their seats and ready to go. 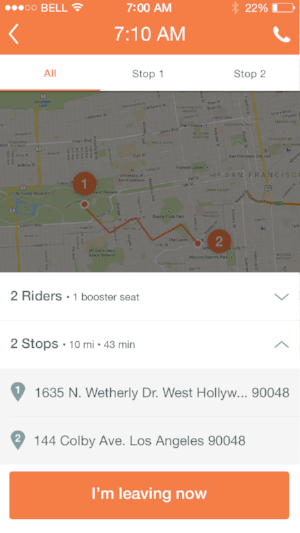 On step 3 of the ride, click the navigation button in the top right corner of the screen to view the drop off address in your phone’s navigation app. Be sure you have read and digested the drop off directions before you begin driving. Return to the HopSkipDrive app by closing your navigation app and clicking on the HopSkipDrive app again. Once you’ve followed the drop off instructions and the riders are safely inside, click the orange “I Completed this Ride” button. Within the next 5 minutes to 24 hours, you’ll see the completed ride reflected in your ride history tab in the HopSkipDrive app.